Daniel Garcia's fraud is in amazing effect, not only because it encourages the mangling and destruction of government property, but also because it is one of the few illusions that is both entertaining and good for the economy. The magician begins the effect by borrowing a signed bill from a spectator (if the spectator protests that they do not have a signed bill, the magician points out that all bills are signed by the Secretary of the Treasury). The magician then lists all of the interesting features of a modern bill -- it's rectangular, it's greenish, it's worth money, you can fold Washington's head to look like a mushroom, etc. When the spectator's eyes start to glaze, the magician indicates a particularly interesting feature of U.S. currency -- the ink never really dries. Then, placing a thumb over the round pointy, spikey thing with the letter in it, the magician drags it across the bill, leaving it next to the Department of Treasury seal. If this isn't enough, the magician then drags around the letters in "The United States of America" until they spell "The United States of Garcia" (the "C" is duplicated and made into a "G"). The magician says that the spectator is free to keep the bill as a souvenir, but they have to pay a dollar for it. Most spectators forget that it was their bill in the first place and pay the dollar. Hence the name of the effect. You're not going to believe this, but I'm going to tell you anyway. In 2005, Daniel Garcia entered into a secret agreement with the United States Treasury Department. 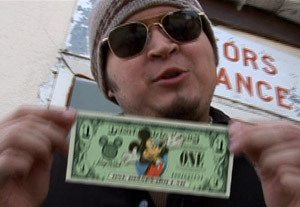 Under that agreement, the Treasury would release into circulation a series of bills with special non-permanent ink, and Garcia would encourage people to deface money, removing it from circulation and thereby helping reduce the possibility of significant monetary inflation. Once you know this, the workings of the rest of the effect should be obvious. The magician simply spots one of the special dollars (easily identified by the fact that the letter at the beginning of the serial number matches the letter in the spikey circle), presses a damp finger firmly against the ink to be moved, and then lifts off the ink. The image from the bill pulls away from the paper and can be pressed anywhere else on the bill so long as it is not given time to dry (2.3 seconds). Easy as cake! With a little practice, a magician can move features around the bill, duplicate symbols, and annoy hecklers by turning their $100 bill into a $001 bill. The only limit is your imagination! Note: After reading this explanation, many people have expressed skepticism about Garcia being able to cut a deal with the Treasury Department. You might be interested to know that the Treasury didn't aid Garcia just to help inflation -- there was also a significant financial incentive. In fact, we hear that, in order to make back his investment, Garcia will need to sell a Fraud DVD to every man, woman, and child in the continental United States (and parts of Canada). This is why I recommend performing this effect only for foreigners -- pretty soon, they'll be the only ones who don't know how it's done. Trivia: It might be illegal to mangle currency in this way. A friend of ours who met a guy who knows about these things told us that using one of those machines at amusement parks that smoosh pennies and print stuff on them is a felony, so this trick is probably treason or something.